I used up nearly every yellow Lego brick in my growing collection, and succeeded in creating a four-sided question-mark cube. A friend at work noted that this could make an excellent Kleenex holder or candy bowl, er box. It’s hollow, and the mushroom is actually sitting in a little hole. 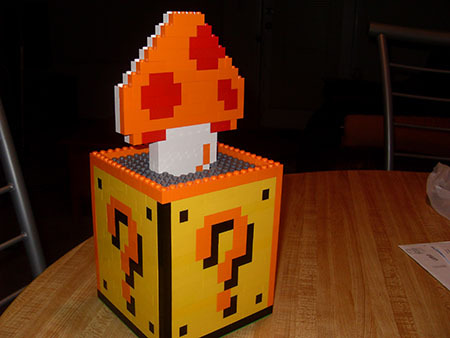 This entry was posted on Wednesday, September 9th, 2009 at 8:54 pm	and is filed under Gaming, Lego. You can follow any responses to this entry through the RSS 2.0 feed. Both comments and pings are currently closed.